If you are over 20 years old, you may remember a time when apples were eaten, clouds floated in the sky, and tweeting is what birds did outside your window. Today, these still occur, but these words have taken on a life of their own with the company Apple, Twitter app, and cloud storage. The "cloud" refers to shared storage areas that are web or network based so that your files can be accessed from multiple devices, whether computer, tablet, or smart phone. Dropbox is a service that lets you access stored files from a variety of devices. Step 1. Visit www.Dropbox.com to create an account. Step 2. Download the software and install on your computer. Step 3. 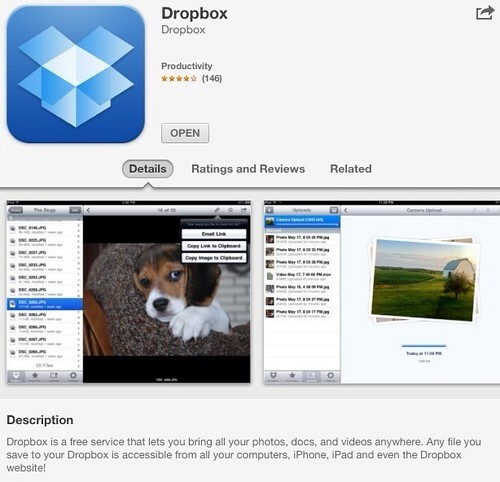 Download the Dropbox app to your smart phone and tablet (link is to the Apple iTunes App Store). Step 4. Begin storing your files! Easily manage files by creating folders. Recently, I joined a Flickr group titled The Sketchnote Handbook, created by Mike Rohde to serve as a sharing area for people who use creative note taking techniques. Mike's book, The Sketchnote Handbook (see the tie-in to the Flickr group? ), is available for pre-order now. One of the sketchers I noticed in the Flickr group is Sacha Chua. As her website and Twitter information is listed on every sketch, I ended up at her website. Sacha frequently shares sketches via Dropbox. This was my first experience with shared files in Dropbox. The ability to share files with others (even non-Dropbox users) is very convenient, especially if the files are large, you have several files, or simply want to control access to the files. One of the folders that is available in Dropbox is the "Public" folder. Any files you place in this folder can easily be shared with others simply by using the link provided for each file. Click on the link below to view the image file for the picture above. If you are interested in joining Dropbox, please click this referral link. You will be able to get started with your own account and I will get additional free space (you can refer people too). Do you already use Dropbox? If so, or if you sign up, let me know. Glad you found that useful! Dropbox is a great way to publish sketchotes on the fly without cluttering up my blog with lots of posts. It's easy to synchronize my laptop with my phone, and then to tweet a link while I'm drawing the next presentation. That way, I can save the blog post for a recap of the whole conference. It's a pretty sweet workflow.